A pure, artistic mother-daughter story set along the Sino-Burmese border in Yunnan Province. Chinese director Pengfei made his debut in 2015 with “Underground Fragrance”, a film set in Beijing’s underground city. Now comes his second feature “The Taste of Rice Flower”, a film that takes the same intricate artistry “Underground Fragrance” demonstrated and transplants it far away to China’s borderlands. Located in China’s southwest next to Myanmar, Laos, and Vietnam, Yunnan Province is a hotbed of ethnic diversity. 25 of China’s 56 officially recognized ethnicities live in Yunnan, and 34% of the province’s population is non-Han. Known for rugged mountains and pristine natural beauty, Yunnan could not be any more different from Beijing. “The Taste of Rice Flower” features one of Yunnan’s minorities, the Dai. With around 1.1 million members in China alone, the Dai people also have a significant presence in Myanmar, Thailand, and Laos. Similar to what he did with Beijing’s underground dwellers for “Underground Fragrance”, Pengfei spent a year living amongst the Dai to prepare for “The Taste of Rice Flower”. As a result, the film does a rather admirable job at showing the Dai’s unique syncretism between Theravada Buddhism and folk traditions through events like the Water-Sprinkling Festival. Alas, such traditions must contend with the pull of China’s modernization. Indeed, the struggle between “modern” city and “traditional” countryside is a strong undercurrent to “The Taste of Rice Flower” — though not necessarily its main focus. Though the film highlights ethnic diversity and addresses the social costs of urban migration (i.e. “left-behind children”), I feel that it’s purpose is more pure than that, more unadulteratedly artistic. Ye Nan and her daughter. In simplest terms, “The Taste of Rice Flower” is a mother-daughter story. Its protagonist is Ye Nan, an ethnic Dai woman who returns to her home village after years away in the city. In her time away, her daughter has grown into a rebellious 13 year-old. 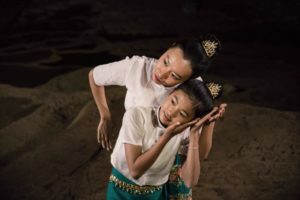 The film traces how Ye Nan and her daughter struggle to reconnect, bridging not only cultural but also emotional divides. Dramatic tension doesn’t seem to be “The Taste of Rice Flower’s” main forte though. It’s a light film whose plot flows like a cool mountain stream. Through a combination of technique and setting, visuals are instead its main strength. Pengfei trained under Taiwanese auteur Tsai Ming-liang, and much of the film’s crew also worked with Tsai — and that easily shows through intricate camerawork and scene composition. The beauty of Yunnan itself provides — literally — color to the film as well. My very first impression upon seeing the film was just how bright and vibrant the shots were, and the film’s final scene in a mountain cave had an ethereal aura to it. I’ve seen quite a few films touching upon the theme of China’s urban-rural divide, and “The Taste of Rice Flower” is a rather unique member of the genre. Much like the Dai people it portrays, it is an embodiment of syncretism — of social issues, artistic purity, and the natural splendor of its frontier environment. The Taste of Rice Flower (米花之味)— China. Dialog in Southwestern Mandarin. Directed by Pengfei. Premiered September 2017 at Venice Days. Running time 1hr 42min. Starring Ying Ze, Ye Bule, Ye Men, and Yang Zuojiu.